Halloween – Don’t throw away the pumpkin, eat it! 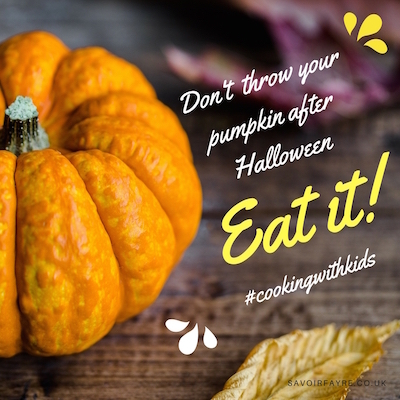 Post Halloween Cooking Inspiration – no more pumpkin waste! Halloween has become a huge event in the UK calendar. So much merchandise in the shops, so many toys, fancy dress costumes, decorations… just for one weekend. But, it is a good excuse for getting people together. Most households will have purchased a couple of pumpkins to decorate the house. But how many people will actually eat the flesh of their pumpkins? Well, recent research shows that more than 5 million pumpkins end up in landfill after Halloween. What???? 5 Million? This is crazy right? A highly nutritious vegetable which is so versatile is being thrown away! Let’s say no to pumpkin waste! So why should we all eat our pumpkin this Halloween? Pumpkins are a fantastic source of beta-carotene which is then converted into vitamin A by the body. Vitamin A is essential for good eye sight, healthy teeth, bones and skin. Wow, this is great. Eating pumpkin is also good the heart because it contains fibre, potassium and vitamin C.
Any vegetables rich in vitamin C provide an immunity boost well needed at this time of the year. If you are feeling a cold coming your way, increase your intake of fresh produce which are rich in vitamin C.
Pumpkin, spinach and walnut spaghetti from Lazy Cat Kitchen: This dish will please the whole family. You can adapt it to suit all tastes; for example, you could use different green vegetables like chard or kale. I would just use wholewheat spaghetti to make the dish even more nutritious. Pumpkin, chickpea, coconut curry from Jamie Oliver: A warming vegetarian dish for a cold evening. This is a good option for “Meat Free Mondays” if you are trying to cut down your consumption of animal products. The chickpeas are an excellent source of protein. Warm roasted pumpkin and puy lentils salad from BBC Good Food: The recipe calls for butternut squash but pumpkin would work very well there. This is a delicious lunch to take to work. Your colleagues will be so jealous! Pumpkin American-style pancakes from A Sweet Pea Chef: Lovely spicy pancake mix which is made with homemade pumpkin puree. Simply roast the pumpkin in the oven (cut into pieces if your pumpkin is rather large). Once the flesh is soft, blend it in a food processor. Then you can follow the instructions on the recipe. My advice would be to cut the suggested sugar quantity by half. I hope you will enjoy these recipes. If we all do our bit, we can reduce the pumpkin waste every year after Halloween. I would love to hear what you are going to make with your pumpkins. Feel free to leave a message below the post. If you have any questions, also don’t hesitate to leave a message. 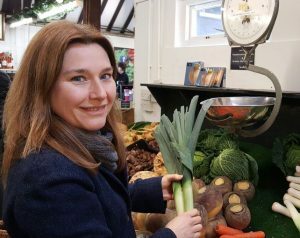 If you feel that you and your family would benefit from a little help in the kitchen, I run very informal cooking workshops. Visit this section of the website to find out more.